On January 25th, 2018yet another Food for Thought Session took place in Eindhoven in the wonderful venue of “Het Ketelhuys”. The topic for this session was “Automated Driving”, presented by Serge van Dam, Key Advisor to the Dutch Government, and Maurice Geraets, Managing Director of NXP The Netherlands. This session was organized by The Orchestrate Group and Purple Square Management Partners. Automated driving is the key technology to future mobility. In the rapid developing world of mobility , Serge van Dam showed the audience (some 50 IT Leaders from various profit and nonprofit organizations) that we are reaching the end of our current car-traffic situation. “Reinventing the steering wheel”. Roads are filling up and traffic comes ever so often to a complete halt, hence: we need to structurally change our car transportation methods. Through the demonstration of various examples, Serge showed how Automated Driving can be the key to solving the pan-European (global) silting up of our roads. In the last 20 years, cars have become more complex in technology and over 3 times as many buttons are present. This rapidly changes the way we use our cars and will continue to change. Governments will need to adapt laws and regulations to accommodate automated driving soon. 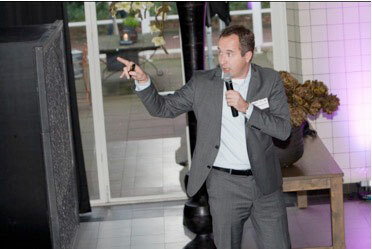 Maurice Geraets presented the possibilities that already exist in Automated Driving and where we are heading to. Modern cars already have more software code lines in them than the newest Boeing 787 Dreamliner Airplane. And as computer chips get faster and become more economical, the use of IT in cars will grow rapidly, making Automated Driving a reality that is closer than we currently may think. People are still the leading cause of traffic accidents. Around 90 percent can be attributed to human errors: risks are not detected, or situations are misjudged, and the driver reacts too slowly or incorrectly. We are able to increase safety by reducing 90% of human errors through the use of automated driving? Radar Applications are increasing, and soon truck platooning will become a new standard, whereby two or more trucks in convoy are linked using connectivity technology and automated driving support systems. After the key note presentations, a panel discussion took place in which challenging statements were used to make the audience reflect on the theme of the event. The event was closed with an informal drink, where the attendees discussed the topics with old acquaintances and new contacts.